As GameWoof grows, we want to help developers with discovery in the Play Store. One way to do that is to build anticipation for games that have not been released yet. Rather than having a simple forum post for the feature, we have built out a system that looks like a miniature Kickstarter. Simply fill out your free Upcoming Game profile and start interacting with your potential audience right away. Put up your screen shots, video trailers, and description, then find out right away if players are interested in your game. Once your Upcoming Game profile is up, players can rate the idea, watch for upcoming news, and comment on the idea. When your game is released on the Play Store, you can easily flip the profile to published, allowing players to still receive news about the game on the GameWoof Player Page. GameWoof Developer Profiles will help Players find out about your company, its members, and your other games. For games that are already in the Play Store, one simple button click will auto-fill your other game pages, allowing GameWoof players to comment and rate the games. In addition, all of your profile info is Google indexed, giving you links back to your site, and exposing your game’s information to all search indexes. Click here to create your free GameWoof account. Once you have that, you will see a button at the bottom of the page called Manage My Game Developer Profile. Click on that to create your developer, company, and game profiles. Please remember, all of this stuff is MVP and will continue to get better every day that goes by. 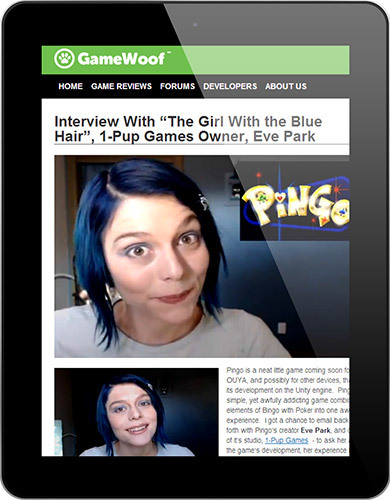 One of the main reasons GameWoof was created was to help developers connect with players because we think that honest interactions between developers and players will help players find the best games and allow developers to sell more games. There has to be a better way than slogging through the tiny funnel of the Play Store, and we have a bunch of ideas. GameWoof will be MUCH more than a game review site. While we are initially launching with a bunch of great reviews written by great writers, our vision is to eventually become the place for players to find the BEST games and for developers to find players. The Google Play store is serving too many masters, and it can’t be good at presenting and selling the best games if it has to sell magazines, books, videos, and music. In addition to great reviews, we have many plans in place for backend technologies that will help uncover, curate, and categorize the best games. Because of our vision and the features that we know we have coming up, we don’t care too much about advertising revenue right now. Of course, we will eventually have advertising (we actually think it is a form of content), but for the first year or so, we are willing to give it away for free. All we ask for is a back link on your site, a tweet, and that you sign up in our GameWoof community, and interact with your players a little. 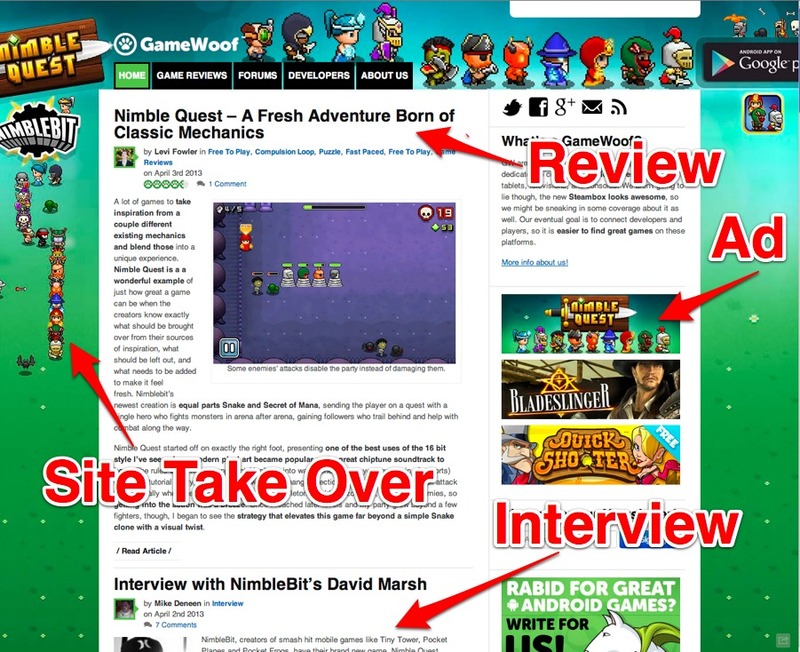 As you can see, we have a featured game site “takeover” that is, ideally, graphics to surround our site, banner and ad copy, a game review, and a developer interview. For all of our interests, we want to review your game before we both commit to doing this feature. While we do pay our writers, we never tell them to write a good review. The NimbleBit guys loved the coverage. Let us know if you are interested in this deal. Of course, we are always interested in reviewing your games. If you want us to review your game, please sign up as a developer, submit your game information, and then contact us. We have been purchasing the games from the Play Store, but would appreciate getting .apks or promotion codes to save a little money. If you have an interesting slant on your studio, we are always looking for new content that our readers would be interested in. Examples of interesting slants: your game was a hit on iOS and it is coming soon to Android, you are a Reddit darling, your players love you but you are not getting any traction in the Play Store, you have come up with a non-evil free to play method that is working and your players are loving, etc. Watch for an Upcoming Games service that looks like a miniature Kickstarter. Contact Kelly Asay, Managing Editor. kelly at gamewoof dot com.